If you work with hydraulic hoses, you know that it is critical to inspect them on a regular basis. Many industrial businesses have a rule in place to inspect hydraulic hoses in Fall River on a monthly basis or more frequently, depending on the type of work that they do. If you experience failures of hydraulic hose assemblies, make sure to inspect and replace them more often to avoid the expense of clean-up and the dangers that they pose to staff. 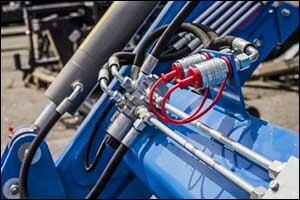 So while we do hear a lot about performing inspections, there aren’t a lot of best practice style tips out there on how to inspect standard and custom hydraulic hoses. If you have a hose that fails or needs to be replaced, make sure to contact or stop by Metro Industrial & Marine Supply in New Bedford. We provide a wide range of industrial supply and services to individuals, professionals, and corporations in the Southeastern Massachusetts and Rhode Island area. We even have custom hoses that can be created while you wait. It cannot be overstated about the dangers associated with touching pressurized hoses. Never touch them with your hands – not even if you are wearing gloves. When inspecting the equipment, use something else to locate a leak or break. A piece of wood or cardboard can be a great way to identify where a leak is coming from in the assembly. Resist the temptation to touch the hydraulic hoses in Fall River with your hands. Hydraulic oil injection injuries are extremely serious and can be deadly. It is essential to avoid contact with pressurized hoses and hydraulic fluids at all costs. Did you know that it only takes a tiny pinhole leak of your custom hydraulic hoses to release enough hydraulic fluid to penetrate your skin and clothing? It is important to never let your guard down around hydraulic hoses. There are lots of safety tips available from industrial supply and services centers because the danger is very real. Systems that are not properly inspected or maintained provide an even bigger risk to workers. Negligence and complacency can lead to serious injuries. A worker could merely slip and fall in the spilled fluid and be out of work for several weeks or more. Or worse, burns from the hot hydraulic fluid, injuries caused by whipping lines, and the most significant type of injury, injection of hydraulic fluid into the skin. While this type of injury might seem like nothing, it can quickly become life-threatening. Ongoing maintenance in addition to regular inspections is key. Your hydraulic hoses in Fall River and the entire mechanical system needs to be properly maintained for best results. All assemblies must be replaced periodically through your Fall River industrial supply. Taking a proactive approach to replacing standard and custom hydraulic hoses is the best way to avoid damage and serious injuries from occurring. Provide your team with safety courses and regular updates about the safety steps required when working with hydraulic hoses and assemblies. This will help make sure that everyone is aware of the dangers and know exactly what to do if a co-worker becomes injured due to a failure. If your business uses standard or custom hydraulic hoses, make sure to stop by and take a look at our options for industrial supply and services. Customers who require hydraulic hoses in Fall River and the surrounding area can count on our team to deliver top quality products and services. We proudly serve a wide range of industries throughout the local area and around the world. From agriculture to automotive, power generation to robotics, textile machinery to production, our Greater Fall River industrial supply helps our customers to keep working and provide a safe workplace for their employees. Give us a call at 508-996-8400 to speak with one of our friendly customer service agents or stop by our location on Coggeshall Street in New Bedford, Massachusetts.